The Ultimate Valentine's Day Strawberry Cocktail - Nisbets Australia Blog - Industry news, trends, recipes and more! Love it or hate it, Valentine’s Day (February 14th) is a great way for your business to cash in. Draw in lovebirds, even singletons, with a cocktail that’s easy to make and easy to drink. 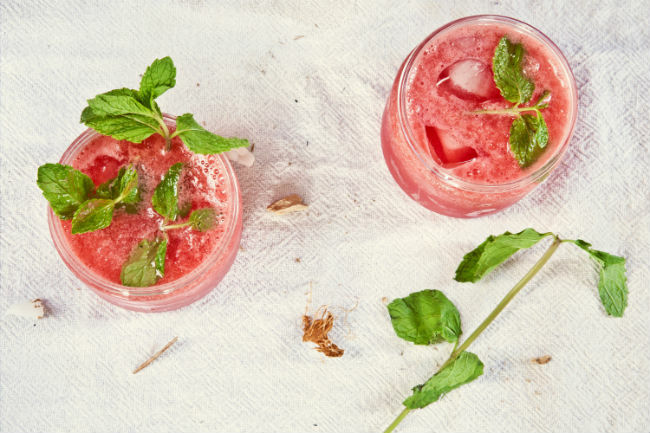 This versatile Strawberry Smash cocktail can be mixed with rum, brandy or whiskey. But we’ve gone for gin, a spirit whose popularity is ever increasing. It’s a great cocktail to make at home too. Its flexibility means you can finish the bottle of spirit that’s been gathering dust in the kitchen cupboard. Smash cocktails are made with a mixture of herbs, sugar, fruit and booze. The sweet strawberry puree complements the zingy citrus flavour of the lime while the flush of the gin warms you through. Grab a tall glass, pour in the sugar and add a squeeze of lime juice. Muddle with the back of a spoon and dissolve the sugar completely. Add one measure of Monin strawberry puree and stir well to combine all the flavours. Fill a tumbler with ice cubes and add the gin. Gently stir to slightly dilute the gin. Top up with soda water and garnish with a spring of mint.